Heriot’s coach Phil Smith has acknowledged the part played by his colleague Ciaran Beattie in keeping the Goldenacre men on track for a league and cup double. Beattie has been handed the task of leading the Heriot’s Super 6 side next season. His background is in video analysis. Smith has used footage of opponents well in his period at the helm. However, he combines his role at the club with a job in education, meaning he is limited in the amount of time he has available to analyse opponents. The benefits of having input from Beattie, who is now in place as full-time Super 6 coach, were evident on Saturday as Heriot’s squeezed past Hawick in the Scottish Cup semi-final 31-29. That victory sets up clashes with Ayr in the final of both competitions. The Borderers offered a stern test in a hugely entertaining contest, with the outcome hanging in the balance right to the final whistle. Hawick had much of the possession and territorial advantage in a tense second half. But Beattie’s analytical input had identified the main threats and helped the Capital outfit to squeeze home. “He is great because he has the time and he brings us information and footage that is all relevant,” said Smith. “I will bring together stuff that is great but he can narrow it down again. He has the ability to do that because of his analyst’s background. 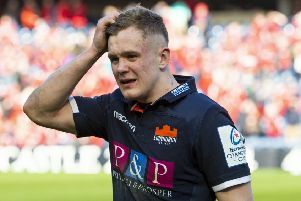 Smith underlined his own skill for reading the game when he made a series of smart tactical substitutions that eventually steered Heriot’s into the final. His team had raced into a comfortable early lead with tries from Rob Kay and Jack Blain, both converted by Ross Jones. That appeared to have set the tone for the afternoon. However, Hawick struck back with a try from Matty Carryer and a double by Keith Davies, with Lee Armstrong booting two conversions. Blain, below, raced over for a second time and Jones again converted, but Armstrong completed the scoring in the first half with a penalty that put the visitors ahead by one point at the interval. The second period was a real ding-dong affair. Jones banged over a penalty to edge the hosts in front once more, but Carryer forced his way in at the corner for a try, converted by Armstrong, that gave Hawick a five point cushion they still held entering the final 15 minutes. As it has done on so many occasions this season, the Heriot’s set piece delivered the vital score. A penalty despatched into touch followed by a powerful drive at the ensuing lineout allowed Josh Scott to apply the final touch. The immaculate boot of Jones added the extra two points. 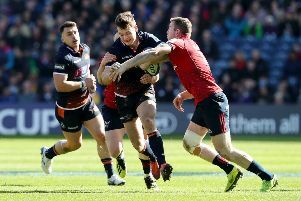 And that, combined with a gutsy defensive effort in the face of a frantic finale by Hawick, was enough to ensure Heriot’s progress to the final at BT Murrayfield later this month. Smith was unhappy with aspects of his side’s performance, but credited the effort of opponents who had pushed his men all the way. “I thought they were brilliant in the way they put us under pressure,” he admitted “I thought they were excellent. The positive is that there are some games when you have to dog it out and we showed a bit of dog.